This is a finger and barrel organ of about 1750, when a Mr Fox was paid by the Harpurs for delivering it to Calke Abbey. The barrel is now missing, but the space it occupied and the way it acted on the key action is clearly visible. The organ has spent all its life at Calke, and is in original condition. It has suffered in recent years, with the pipes all thrown hugger-mugger during a move to its present position at the foot of the main staircase. The pitch is a¹=421 at 16ºC. The compass is C D to d³. 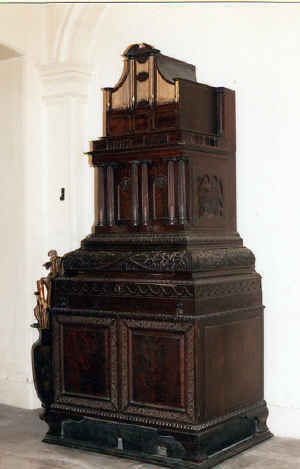 In 1988 Martin Goetze carried out conservation work to the organ, to prepare it for display at the opening of this remarkable house by the National Trust,https://www.nationaltrust.org.uk/calke-abbey but it was decided not to restore it to playing condition, so that the original elements, such as the very early tracker buttons, could be preserved.